Go dual and travel in peace. No more arguments about whose device takes priority. Whether you are on a road trip with your sales team or taking the family to the beach, the Gomadic Rand McNally IntelliRoute TND 530 Dual Car Charger makes traveling fun again. 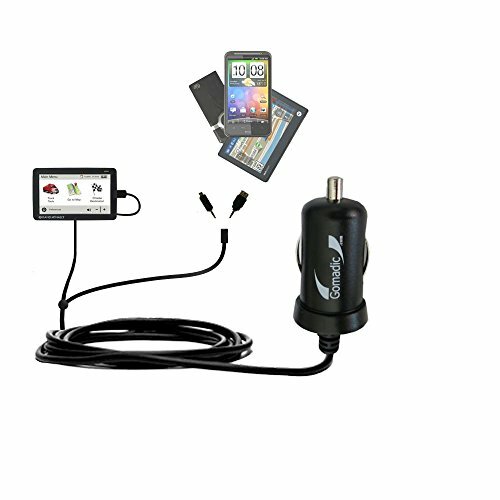 Compatible with the Gomadic innovative TipExchange Technology and backed with a lifetime warranty, the Rand McNally IntelliRoute TND 530 Dual Charger gives you limitless options for charging your gear on the go. Simply leave the charger intact and rotate your device by plugging in the removable tips that are custom-made for all your devices. Just lock, load, and shuffle without any hassle or worry. While we get you started with tips specifically designed for the Rand McNally IntelliRoute TND 530 as well as a standard MicroUSB and a Female USB connector, we have tips for thousands of additional devices available separately. Take multitasking to the next level and enjoy all the versatility with the Gomadic dual charger. You will not regret it! Integrated TipExchange Technology protects your investment by providing a mechanism to change/upgrade your charger by simply swapping the physical charging tip. Rand McNally IntelliRoute TND 530 specific tip as well as standard microUSB and Female USB tips included. Additional tips sold separately. Extremely compact and with a powerful advanced circuit design that provides precision voltage and current regulation specific to the Rand McNally IntelliRoute TND 530 (accurate to 0.1v). Secondary charging port is available for optional charging of second device. Advancements in circuit minimization provide a full 10W of available charging current to an adapter comparable in size to a US quarter. Considerably higher available current (2000mAh) when compared to standard Rand McNally IntelliRoute TND 530 vehicle chargers.